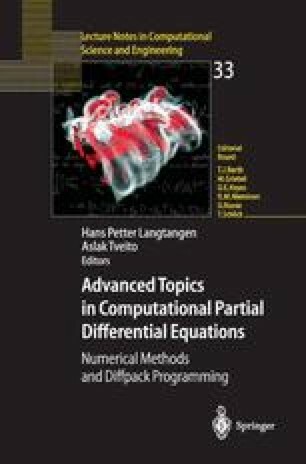 The purpose of this chapter is to give an introduction to stochastic partial differential equations from a computational point of view. The presented tools provide a consistent quantitative way of relating uncertainty in input to uncertainty in output for PDE-based models. We first give an analytical treatment of some stochastic differential equation model problems. These problems concerns deflection of a beam with random loading and material strength, heat conduction in random media, and pollution transport with random advection. Later, we develop Diffpack simulators for solving the model problems numerically. Two numerical solution methods are addressed: Monte Carlo simulations and perturbation methods. The main tools for generating and estimating stochastic variables and fields are outlined, and we show a suggested design of stochastic PDE simulators, which makes it easy to equip a standard sequential Diffpack simulator with stochastic treatment of uncertain input data.